NOTE - The author’s name has been changed to protect his privacy. There are those that will accuse me of being a closet Anti-Semite camouflaged with sidelocks, a long black suit jacket and a wide black hat. That my entire reason for joining the Jewish People was simply to sabotaged them from the inside out, gaining insider status in order to sow seeds of hate. Apparently. Though such a stunt would make me positively Machiavellian and possibly an evil genius, I must admit that I am neither of these. Not a modern-day Machiavelli nor a genius of any stripe. I pray, learn Torah, work, help take care of my children and occasionally complain about the rising price of this product or that, more or less typical of most other men in the Hasidic community in which I live. Life is, at this juncture, more or less ordinary. Fantastic, thank G-d, but ordinary. What is so not ordinary is where I come from and how I got to where I am today. 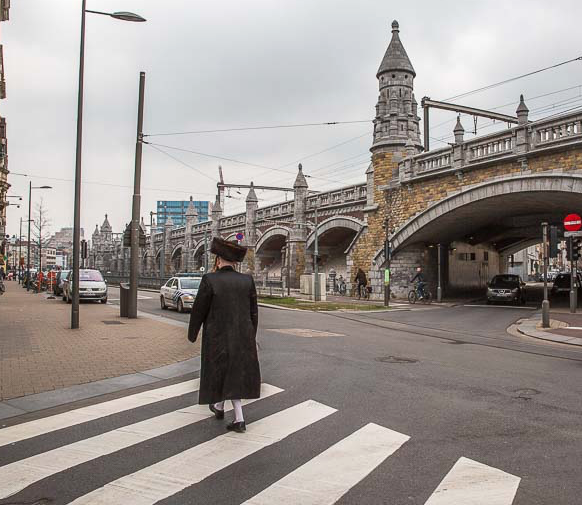 Raised in an US Metropolis in the South by devout evangelicals Christians, my upbringing is essentially the reverse of my current European Hasidic life. My Southern twang has been replaced by something far more Continental and the cobblestoned streets and centuries old architecture of the city in which I live have long since lost their exoticism. The Jewish family man of today wouldn’t recognize the eager youth pastor of yesterday. Growing up amidst a new and more tolerant South, other cultures in general and Jewish culture in particular were afforded no small portion of respect, a far cry from the too often stereotyped Southerner who can barely read his electric bill and sees red when someone or something different comes into view. Though we clung deeply to our beliefs, that devoutness wasn’t peppered with a distain for “the other”. And my experience is not atypical by any stretch, which is evidenced by the budding array of communities that are now calling the South their new home, the thriving Jewish communities of Atlanta and Dallas stand out in particular as proofs. Ours was the “New South”, one glittering with promise, a future full of understanding. “So?” quips the astute reader. “Why did you leave then?” That’s precisely the point. My leaving Christianity and a possibly shining future amongst the clergy had nothing to with a lack in terms of my material situation or even social situation. I left because I saw something so breathtakingly beautiful in the visage of Judaism that I couldn’t turn my back on it and return to business as usual. There was a purity that is all too frequently is discarded by many in halls of their local elementary schools, to be “upgraded” by a cliched cynicism and comic machismo. To meet a 16 year old Hasidic boy who has never even touched a computer, because in his home there isn’t one (or in the homes of his friends for that matter), and doesn’t have even the slightest inkling of the filth that one can see on the Internet was like stepping into a world constantly bathed in some brilliant light. Here lived purity and holiness. Again chimes in the perceptive reader. “Okay, I’m very happy for you, but what does this have to do with True Torah Jews? What’s the tie-in?” It’s simple. Because the world deserves to hear the truth. Though there were myriad reasons that I choose to become Jewish in general and a Hasidic Jew in particular, there was one overriding factor that influenced me above all else. Judaism’s unrelenting and unabating pursuit of truth. Because the current storm of protest that pours out of the mouths of those who are politicians first and Jews fourth warrants rebuttal. Because there is a country that advertises itself as the “Jewish State” but who’s actions speak more often than not to a deep-seated contempt for all things traditionally Jewish. Because instead of the beauty that I first saw in Judaism there are those who are selling hatred, bigotry and lawlessness. Because I couldn't live with myself if I saw someone attempting to tear down all that I love and hold dear and said nothing. Lastly, because that 16 year old Hasidic boy can’t answer them. He’s too innocent and consumed with his service of G-d to even be aware that there exist such people who presume to speak in his name, when they preach a violent atheism which is antithetical to what he and his community believe. Their lack of technological savvy alone leaves them at a stark disadvantage. Just as in the times before, when an amateur “prophet” arose in Israel, Theodor Herzl, proclaiming his own false prophecies throughout the land, so too now have second rate fortune tellers and Zionist PR men arisen in an attempt to fool the world at large about the meaning of that single word, "Jew". Their dreams and prophecies have become our collective nightmare. The torrent of scorn which rains down on all those who dare challenge the official Zionist stance on any topic, be it the latest UN resolution, the settlements or what have you, was baffling the first time I experienced it but, unfortunately, I have since become acclimated to the Zionist establishment’s incessant clucking like a chicken farmer becomes acclimated to the clucking of so many hens. Sadly, those who have the gall to question or challenge their official (read: whitewashed) history are subsequently banished to a Zionist leper colony, courtesy of the Jewish Agency. The leper’s crime? Being a self-hating Jew, of course. Honestly, I heard better instances of name calling on the public school playground. But I don’t blame them for their lack of originality. I guess I’m just understanding like that. However, what’s worse than being browbeaten for holding fast to the Torah view is when these same bullies trumpet themselves as the ambassadors of the Jews when a large portion of said Jews aren’t aware of who’s doing the representing and how they’re doing it. Even when those in the Torah community, particularly the Hasidic community, are aware they seldom have the skills to answer the accusations hurled at them. Though some might answer me that it’s the Torah community’s fault for not demonstrating more political shrewdness, I would counter that you would be hard-pressed to find someone critical of the Amish for their lack of street-smarts. Jewish life has always been one of divine service throughout the ages, till a new enemy reared it’s ugly head, spouting their dogma as the official position of all Jews. This partisan darkness is not what I left the religion of my forefathers for. Throughout my relatively few years as a Jew my concern has grown by the day. A sort of sickly, neurotic nationalism has taken hold of portions of the Holy Nation, one so cartoonish that is makes the overstated patriotism of some backwoods hillbillies look positively urbane. The world has been sold a false bill of goods on the nature of Judaism and the point has come that I cannot contain my pain any longer. I didn’t sacrifice my future in the church, relationships that I held dear and the only world that I had ever known for a politicized Judaism, a nationalism disguised in a tallis, where state comes first and G-d a distant second or even third. The passport of the nation I joined read “Torah” not, “The State of Israel”. To those who rant and rage for the Zionist cause. You don’t get to speak in my name. I never voted for you, never asked your opinion, never gave you power of attorney to make decisions in my name. Neither did the rest of the Jewish People. Don’t sell me darkness and package it as light.